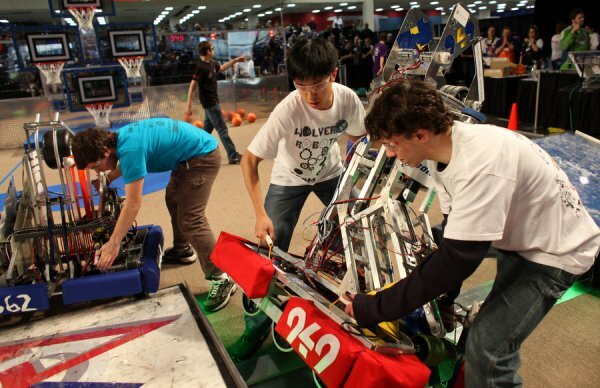 Every year since 2000 there has been a Regional FIRST Robotics Competition (FRC) held in Seattle at the CenturyLink Stadium. 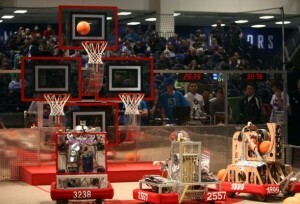 (see adjacent photos of the March 2012 competition and this FIRST FRC Promo Video). This is the highest level of FIRST for high school students and it is run like a sports competition. This past year there were 70 FRC teams from Washington State but no teams from Olympia. OSD is planning to change that with the help of STEM Pals, sponsors, coaches mentors and dedicated volunteers. The team is planned to start up in October 2012 and start preparing for the competition in January and February 2013. OSD has applied for a state iGrant to provide the base funding for the team, but more funding is needed (see Funding Needs webpage). The support of STEM Pals is key to getting this team off the ground.